Dr Lauren Ayton, a 2015 Victoria Fellow recipient. Championing innovation in Victoria’s economic future and recognising the need for Victorians to be skilled in science, technology, engineering and mathematics (STEM), each year since 2004 the Victorian Government has funded 12 Victoria Fellowships valued at up to $18,000 for short-term overseas study missions, administered by veski. Ayton is the Director of Clinical & Regulatory Affairs, Bionic Eye Technologies, New York. Here, she talks us through her career journey. When you were younger, your two brothers had vision problems. Is this why you wanted to research ways to help people see again? Yes. My younger brother had amblyopia, “lazy eye”, which was easily treated with a patch and glasses. Unfortunately, my older brother had multiple disabilities and severe vision loss, and I always regretted the fact that his vision could not be helped. While many eye conditions can now be treated – like surgery for cataracts, or glasses for short-sightedness – my research aims to help people for whom there is currently no option. I love the fact my work has a direct translation to the patients I see in clinical practice, and look forward to the day when many of these conditions are curable. Why did you apply for a veski Victoria Fellowship? I’d attended numerous veski events in Melbourne before hearing about the Fellowship program, and had great respect for the work that the organisation does. When I heard about the opportunity, I was excited to become more involved with the world-leading scientists, business people and thinkers at veski. The funds were a bonus! How did you use the funds? The support allowed me to travel to Europe for several meetings, including chairing at Artificial Vision 2016, one of the leading bionic eye conferences. I was able to meet with colleagues, who are part of an international taskforce I formed, to generate consensus on methods of testing participants in trials of vision restoration interventions. The networking on this trip helped me to gain my current role at a bionic eye medical device company in the US. Also, being a veski Fellow allowed me to form incredibly beneficial contacts within the Melbourne community. How is Victoria a leading medical research hub? I’ve always been incredibly proud of the work Victoria does in the field of medical research. I now have the opportunity to view it from the US, and continue to be impressed. Victoria has a world-wide reputation as a leading location for research, and part of that is due to the collaborations between universities and medical research institutes. Who have you professionally collaborated with in Victoria? People from varied backgrounds: industry, medical practitioners, scientists, communications experts and journalists. That diversity of knowledge leads to ground-breaking new ideas and the innovation our state is known for. It’s a great place to be, and I’m looking forward to coming home. How have you helped engage girls/women to enter STEM careers? I’m passionate about promoting women in STEM. I’ve been involved with a number of organisations with this goal, including the Growing Tall Poppies program, the annual National Science Week held in August (at City of Melbourne and Victorian Government events) and as a guest speaker at high schools. I also love speaking to young people about STEM through my role as a radio broadcaster. Where does Victoria really shine when it comes to STEM? Victoria is an outstanding location for STEM. Not only do we have world-leading research institutes and universities, but some amazing science outreach. From Scienceworks, to the Melbourne Museum, to the Science Gallery at Melbourne University…the list goes on. I love that so many scientists are out explaining what they do, and encouraging everyone to experience the magic of STEM. You’re the Director of Clinical & Regulatory Affairs at Bionic Eye Technologies, a New York-based medical device startup commercialising vision prosthetic devices from Harvard University, Massachusetts Institute of Technology and Cornell University. What does your role entail? I’m very excited to have recently joined this medical startup company. The bionic eye technology they’re developing has a similar purpose to the technology I worked on in Melbourne, but with different manufacturing and engineering processes. My main role here is to work with patients and lead future clinical trials. Also, I’m involved with the regulatory processes, working with the US Food and Drug Administration. It’s a great experience to be working in such a dynamic field with world-leading engineers and scientists. It can vary a lot! I may be working with our engineers in the Cornell Nanofabrication Facility (where they make medical devices at unbelievably tiny scales), planning with surgeons and doctors (including our Medical Director and Project Founder, Dr Joseph Rizzo at Harvard University ) or speaking with potential recipients of bionic eye technologies. I love that this exciting technology (which sounds like it should be in a science fiction novel) is so close to reality for people with severe vision loss. I’m lucky that my research allows me to work closely with the scientists behind the devices and the people that benefit from them. And I love the fact that I am always learning. Going deeper, you’re an emerging leader in the field of bionic eyes. Tell us a bit about that. Before my move to the US, I was the Clinical Team Leader of the Bionic Vision Australia group in Melbourne. This group developed and tested a world-first “suprachoroidal” bionic eye (which means the implant goes in behind the retina, at the back of the eye). Through this work, and my position as a Senior Research Fellow at the Centre for Eye Research Australia and the University of Melbourne, I’ve worked with experts in the fields of stem cells and gene therapy. These are other research methods that may help severe vision loss. It’s essential that a number of approaches are developed, as there are so many different causes of blindness. There’s no “one-size-fits-all” solution for vision loss, and so I hope to be able to be involved in all these areas into the future. How quickly is bionic eye technology developing? The proliferation of research teams and companies in this area means that over 300 people have bionic eye implants around the world, and we’re all learning from their experience. While bionic eye technology is developing rapidly, the vision gains are still relatively modest. 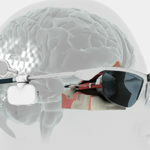 There are now three companies that have regulatory approval to sell bionic eyes around the world. At the moment, the resolution of the devices helps people navigate and find large objects; the ultimate goal is to allow people to have finer resolution, maybe even the ability to read or see faces again. What other grants have you received? I’ve been a recipient of multiple grants from the National Health and Medical Research Council (NHMRC), including a 2017 Next Generation Clinical Researchers Fellowship. I’ve also had wonderful support from the Macular Disease Foundation of Australia (for work I do in the field of macular degeneration), Retina Australia (for work on low vision and an eye disease called retinitis pigmentosa) and the Melbourne Boston Sister Cities Association. As a young researcher, philanthropic organisations are also incredibly supportive, and I’ve received funds from the Ian Potter Foundation, the William Angliss Foundation, the Harold Mitchell Foundation and the Australian College of Optometry. You also volunteered as a clinician to provide eye care in South Africa, Zimbabwe and Sri Lanka between 2005 and 2006. Which organisations did you work with? Red Cross, the International Centre for Eyecare Education and the University of Durban-Westville. One of the things I loved the most about the work was the philosophy of these organisations. Rather than just go to these countries and provide eyecare (which is useful, but short-lived), the goal was to educate and skill the local community to continue the work once we had gone. So, the trips were a combination of clinical care for the community, but also education for the local doctors and nurses. An amazing experience. And, as if that’s not enough, you’ve co-hosted 3RRR radio’s Einstein A Go Go program since 2012! Any other broadcasting plans in the pipeline? Co-hosting 3RRR has been an amazing opportunity for me. Dr Shane Huntington, the host of the program, leads our interviews of inspirational scientists every week. Most are from Victoria, as well as other world leaders, and it has allowed me to learn so much from outside my field of ophthalmology. My broadcasting on 3RRR also led to opportunities on other radio shows (including Jon Faine’s Conversation Hour on ABC Radio, 2016 – 2017) and on television. I’m currently negotiating radio opportunities in the US, and will still be on 3RRR – they can’t get rid of me that easily!